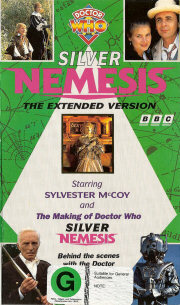 I have to admit that when I first saw Silver Nemesis way back in 1988, I really enjoyed it. However subsequent viewings proved it to be, for me anyway, a hopelessly rushed and essentially plotless 75-minute chase scene, with little in it to entice a repeat viewing. But now I find myself having to revise that opinion with the release of The Extended Version at last we get to see the story as it should have been, and it is pretty damn good! Of the twelve minutes or so of extra footage, most of it is in Part One, which definitely suffered from disjointedness in the original version. The new material once and for all settles the niggling point of just how the Doctor and Ace got away from the Windsor Castle guards (groans all round at McCoy's 'spectacle' pun! ), and we finally get a look at the beautiful, specially-painted, portrait of Sophie Aldred in 18th Century dress. You can also now pick out Nick Courtney doing his cameo as a tourist, if you're that way inclined! Basically, with the new footage, Silver Nemesis has more plot - something the old version eschewed in favour of non-stop action. We get a far better insight into De Flores's reasons for taking the Nemesis, at last discover how the Cybermen know the Doctor is the Doctor, and we are treated to a further insight into Lady Peinforte's insane dreams of conquest. Personally, though, Fiona Walker's OTT acting is so bad, I would have thought the story could have benefited from having her scenes removed! There's precious little new stuff in the third episode which is a shame as that was meant to be the 'tell-all' part about the Doctor's past. Anyone looking forward to new footage explaining who the Doctor really is will be disappointed. Fans of Mrs 'Clahm on in, honey' Remington are in for a treat, though! As well as the story, the tape also includes the American documentary. Generally excellent with some great interviews, but rather spoilt by the condescending 'Aren't the Poms quaint, with their silly old series?' tone of the narration. Silver Nemesis - The Extended Version is an excellent double feature, vastly superior in terms of value for money to the somewhat disappointing Curse of Fenric re-edit. If you thought the 25th Anniversary story was a damp squib, a look at this new version may very well change your mind. This new release is unusual in that a documentary on the making of the programme is available on the same cassette. Having extended footage of the 25th Anniversary story alone makes this tape a must for all Doctor Who fans (bringing the question: is this new footage true Who?). The extended footage is easy to spot, due to the absence of incidental music from these scenes - however this does let it down. These extra bits also reduce the story's complexity, enabling the average viewer (who unfortunately is unlikely to buy the video! ), to understand a few more of its 'hidden plots'. Of course Silver Nemesis is not the best choice for the anniversary story, but it really isn't that bad. The Cybermen, although not very convincing, give the production a much more 'glossy' feel with their new lighter-coloured suits. The documentary is to my mind very well done, allowing you to see the stress put on the cast and crew of a Doctor Who production. All in all, Silver Nemesis is not the worst story of Season 25, and this video release is an added bonus to any Doctor Who fan's video collection.